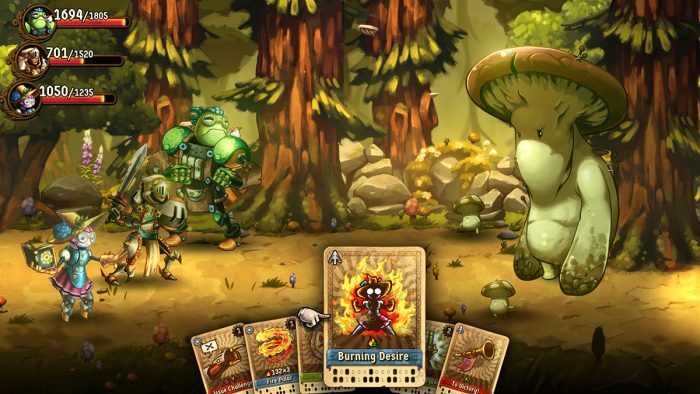 Image & Form’s SteamWorld Quest is debuting later this month, and for all intents and purposes it’s far enough along that any preview will be fairly true to the final version of the game. Any major issues or problems, any bugs or bumps likely wouldn’t be fully fixed in time. Anything we don’t like about its sudden series shift to turn-based RPG wouldn’t be able to be altered. Frankly, it is what it is. I’ve wanted the SteamWorld universe to take that RPG jump for a long time. Seeing how Heist handled a more complex gameplay that mixed turn-based combat and a rich cast of characters, I had a feeling that an RPG was an obvious evolutionary step. Image & Form thought so as well, and Quest was born. In true to company form, the game is a spin on what we’d expect out of the genre. 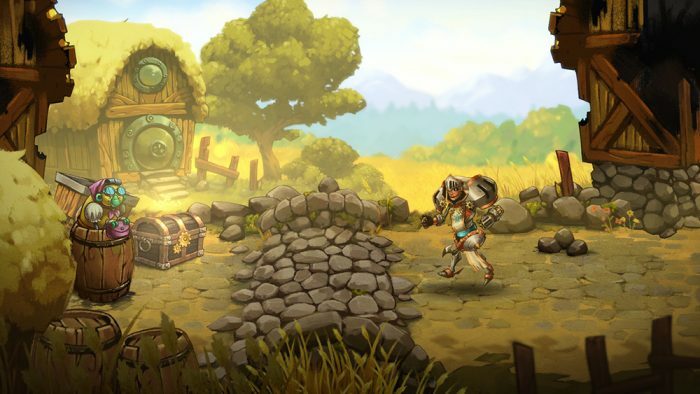 The game doesn’t feel like an RPG in the SteamWorld universe, but SteamWorld turned into an RPG. It’s most obvious with the visual design, as the same hand-drawn robots and worlds are showcased in the best HD in the series yet. They’re big and bold and fill up the screen, and look great on the Switch in handheld mode. But that’s par for the course with the company and its franchise, who have seemed to capture some magic in a bottle that keeps improving the games in big leaps. Thirty minutes. That’s all the time I had with the game’s demo at PAX East, but it was enough to soak in the basics of its innovative machinations and come away feeling impressed with the freshness of the complete experience. The demo drops us off early in the game, in which we already have two of the three characters in our battle party, Copernica and Armilly, as we trudge through a town recently decimated by an evil army. The game might seem linear, but only because it’s in the series 2D sidescrolling style. We move forward and backward across a plane, up and down through rooms and doors and passages, but there are enough extra paths to foster exploration. It feels as linear as Heist (which really wasn’t) but with enough freedom to not be constrained. As we move along, we meet NPCs and find treasure, and encounter both grunts and minibosses, like a robot adorned with furs and a fox on his shoulder. The demo culminates in a battle with a giant mushroom beast. Unlike previous SteamWorld games, this one seems to mix in more living creatures than ever before. My favorite is possibly the leader of the army we face against, Captain Canary, who is quite literally a bird in a cage attached to the top of a body of armor. The narrative and setting are only a part of the experience. In fact, I wouldn’t classify this as a true card-battler. Instead, the game uses cards to visually represent different moves and combos, all of which can be unlocked and collected and organized to our liking. It’s not Hearthstone or MTG or even Baten Kaitos, but still keeps the battles fresh instead of just being a standard selection of RPG choices, and forces us to balance our fights. 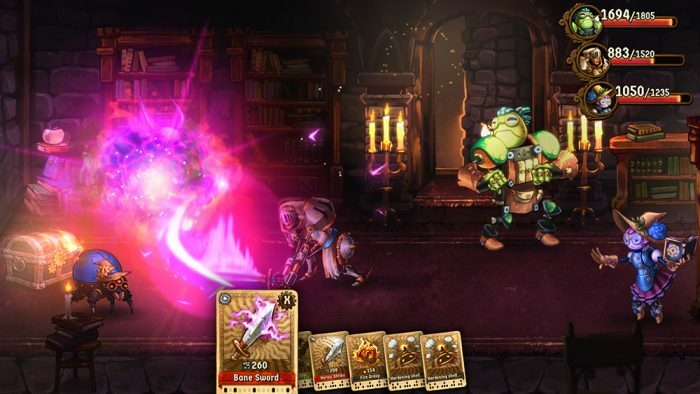 Characters have unique customizable decks and attacks, and attacks require Steam Pressure, with stronger attacks requiring more and weaker ones actually building up the resource. We only have a certain amount per series of attacks, so there is a some strategy needed to make sure we are utilizing our hand to its fullest. The PAX East demo starts off with an understanding of these basic motions, such as which attacks are more powerful and which are better to use as in-betweens. During fights with enemy grunts at the village, we learn to alternate between Armilly’s melee attacks and Copernica’s equally powerful magic ones, as well as cards that let us defend or protect or reflect back attacks. Using three in a row from the same character unleashes a fourth bonus attack in the sequence, for even more effect or damage. Instinctively, RPGs have me grinding the attack button over and over again until a battle ends, but that mindlessness is gone here. Quest replaces used cards with new ones at the beginning of each round, randomly drawn from our character-specific decks, resulting in draws that can end up defense heavy in a time when we want to make a final strike. Thankfully, a battle timeline at the bottom of the screen tells us what is coming up next, between us and the enemy, and lets us configure accordingly. Things get complex very quickly in the demo, especially later when we add a third playable character, the big frog-like healer Galleo as the town burns around him and more of the enemy is revealed.